Let me say up front that if you don't have an email list of your blog then you are missing a hell lot of traffic for your blog. Why? because it's easier to get visitors to your blog but retaining them is a big deal. Let's say 90% of your traffic comes from the search engines. The visitor lands, scroll, learn from your blog and leave. But how about if you have an email subscription and he then subscribes to your blog. Now whenever you will publish a new post, he will then be notified through emails. It appears only in desktop version of your blog. It pops up automatically just after 5 seconds. It uses FeedBurner Email Subscription. It only appears once your blog is loaded completely so it won't effect page load time of your blog. Just above </head> tag paste the following CSS styles. Search for <body> tag and just after it paste the following code. Search for <body> tag and paste onload="myFunction()" before > sign. Now your code will look like this! 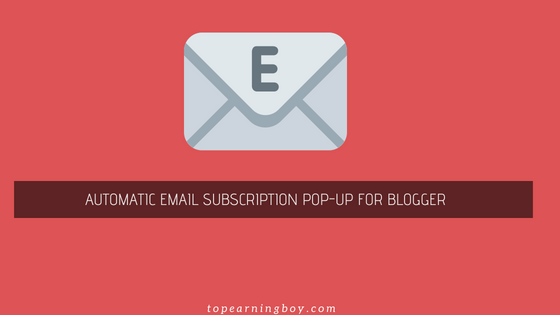 Note: This will make the email subscription pop-up to appear only when all your blog elements are loaded completely. Replace topearningboy with your FeedBurner username. Replace 5000 with 7000 if you want the pop up to appear after 7 seconds. Replace above highlighted texts with your own if you want to. Would love to hear your thoughts on this amazing widget created by your very own TopEarningBoy. I tried my best to keep it as simple as I could. Hope it may add a new soul to your blog. You are most welcome to share this pop up widget with your readership as long as you attach credit link back to this page.